Elementary Theory of Computation. The Mathematical Concept of Algorithm. Church's Thesis. Universal Programs and the Recursion Theorem. Complexity of Algorithmic Unsolvability. Recursively Unsolvable Problems. The Arithmetical Hierarchy and Degrees of Unsolvability. Abstract Complexity of Computation. Recursiveness and Complexity. Complexity Classes of Recursive Functions. Complexity Classes of Primitive Recursive Functions. Polynomially- and Exponentially-Bounded Complexity Classes. Finite Automata. Context-Free Languages. Elementary Predicate Logic. Logical Analysis of the Truth Concept. Syntax and Semantics. Completeness Theorem. Consequences of the Completeness Theorem. Logical Analysis of the Concept of Proof. Gentzen's Calculus LK. Cut Elimination for LK. Consequences of the Cut Elimination Theorem. Complexity of Logical Decision Problems. Undecidability and Reduction Classes. Incompleteness of Arithmetic. Recursive Lower Complexity Bounds. Bibliography. Index. The theme of this book is formed by a pair of concepts: the concept of formal language as carrier of the precise expression of meaning, facts and problems, and the concept of algorithm or calculus, i.e. a formally operating procedure for the solution of precisely described questions and problems. The book is a unified introduction to the modern theory of these concepts, to the way in which they developed first in mathematical logic and computability theory and later in automata theory, and to the theory of formal languages and complexity theory. 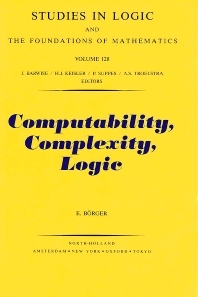 Apart from considering the fundamental themes and classical aspects of these areas, the subject matter has been selected to give priority throughout to the new aspects of traditional questions, results and methods which have developed from the needs or knowledge of computer science and particularly of complexity theory. It is both a textbook for introductory courses in the above-mentioned disciplines as well as a monograph in which further results of new research are systematically presented and where an attempt is made to make explicit the connections and analogies between a variety of concepts and constructions.